I love infinity circle scarves and I also love knitting with chunky yarn -- so this is probably one of my favorite projects thus far! 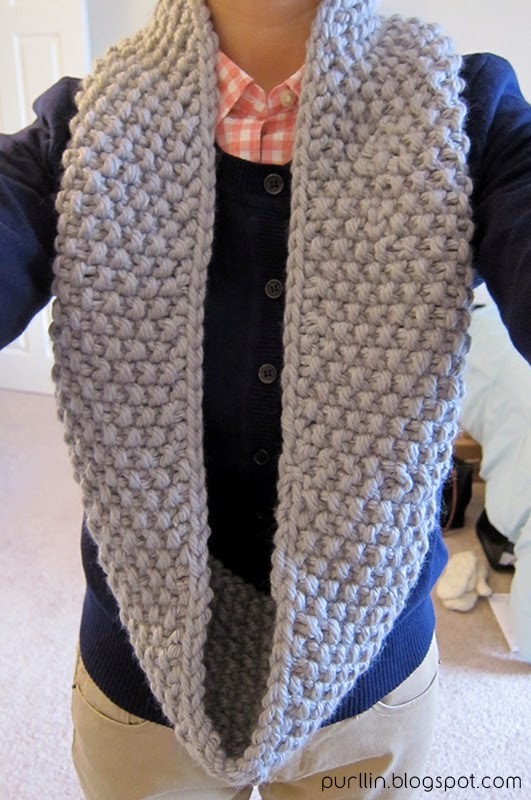 I decided to go with the seed stitch to give the scarf a textured pattern. 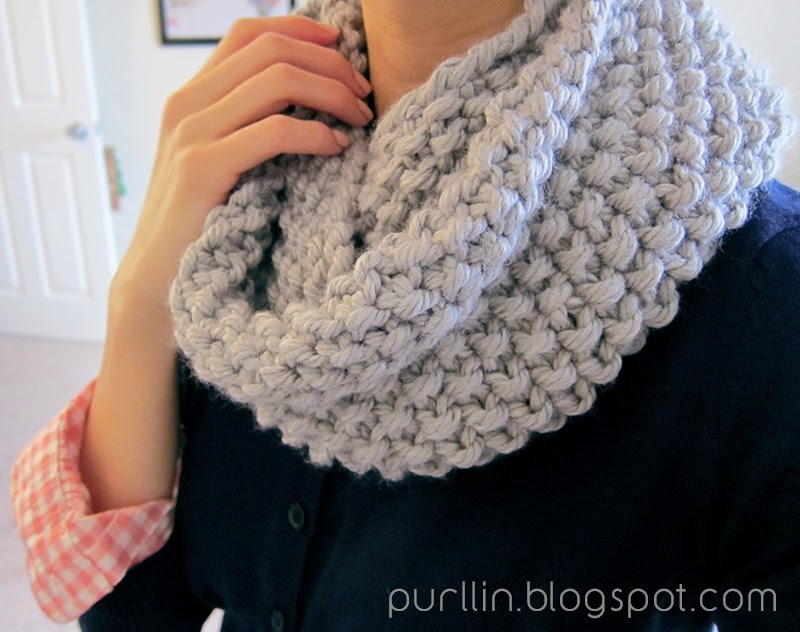 This is a great scarf pattern for beginner knitters since it is not only easy/quick to knit with chunky yarn, but the seed stitch can be knit up with just two basic stitches: knit and purl (watch the knit stitch 'how to' tutorial here, and the purl stitch tutorial here). My scarf ended up being about 48 inches in circumference and 6 inches in width, thus allowing it to comfortably wrap around twice and provide ultimate warmth during the winter months. By the way, Lion Brand's Hometown USA is my all-time favorite yarn because it's chunky & extremely soft! Money saving tip: If you decide to purchase your materials online, don't forget to shop through a cash back link. I most commonly shop through my Discover credit card cash back program or ebates. Ebates offers up to 4% cash back on amazon.com purchases (depending on which category you shop from). You can sign up for ebates here; it's super easy and quick. Using 36'' US 15 circular needles, cast on 100 stitches in the round. If you try this pattern out, please tweet or instagram a picture of it to me! Hey, I've tried doing the knit stick for one stitch then the purl stitch for the next and so on. Is it supposed to be alternating one stitch knit and one purl or is it one knit stitch round and then purl stitch round? I'm going crazy over here! It should be one stitch knit, then one stitch purl. Hey Lisa. Is it possible for you to do a video on how you join a new skein of yarn? I want to know how you do it! The tutorial about how to join a new skein of yarn is now live on YouTube: http://www.youtube.com/watch?v=jRD4iey8jCA Hope this helps! Did you use 2 strands of yarn held together for this? I love this pattern! I want to make it for my friend but the nearby Joann's only had Lion Brand Homespun (and the other chunky yarns were not the right color/softness). I was wondering if you had a gauge for this pattern or any tips for me. Thanks! Scatty's Q: "I'm making your dec seed st infinity scarf but using lion brand homespun and 10 1/2 size needles. What would you suggest for sts #"
Purllin: "hmm, I'm not sure about exact stitch #, but u would think using the same stitch pattern should be ok. :) I don't think it'll end up w same measurements, but it shouldn't make too much of a difference. I'd add more just to b safe. 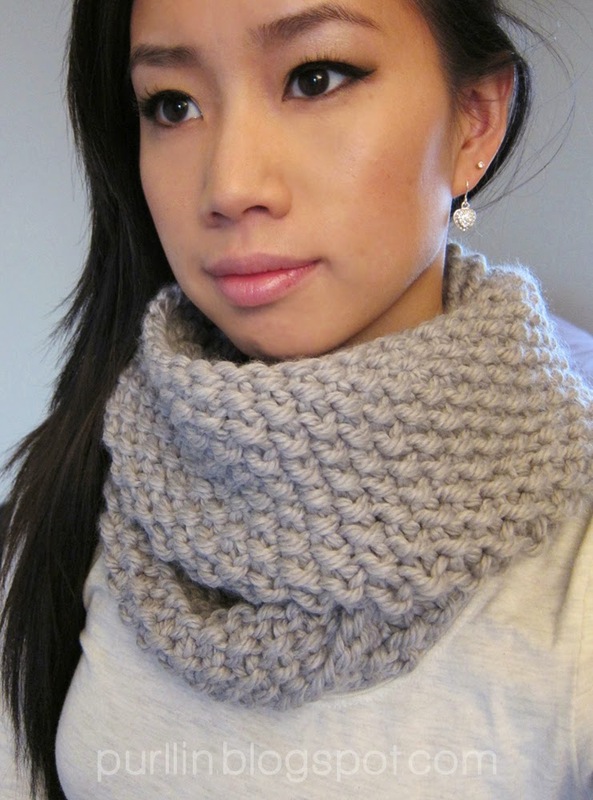 and since it will be layered (wrapped around the neck more than once, it should be ok!" Scatty: "Here's the cowls I made :) Thanks for posting your patterns. http://hungryraptor.tumblr.com/post/41217263020/here-are-the-cowls-that-i-made-for-my-friends-this "
The cowls are absolutely beautiful, Scatty! You did amazing!!! Hiiii, the yarn you used. Is it simply the "Chunky" kind or is it the like the "Super Chunky/Bulky" kind. I have Lion Brand Wool-Ease Chunky. The yarn I used suggested knitting needles US size 13. I'd consider it more super chunky/super bulky than regular chunky. The lion brand "thick & quick" is a size more similar to the yarn I used. Hope this helps! Hi Lisa, I really like this scarf! I'm new to knitting...so this question might seem silly, but I was just wondering if this pattern would work with 32" circular needles? I couldn't find any with 36". Will I be able to wrap the scarf around my neck twice still if the length is shorter? And do I cast on less number of stitches, instead of the 100? 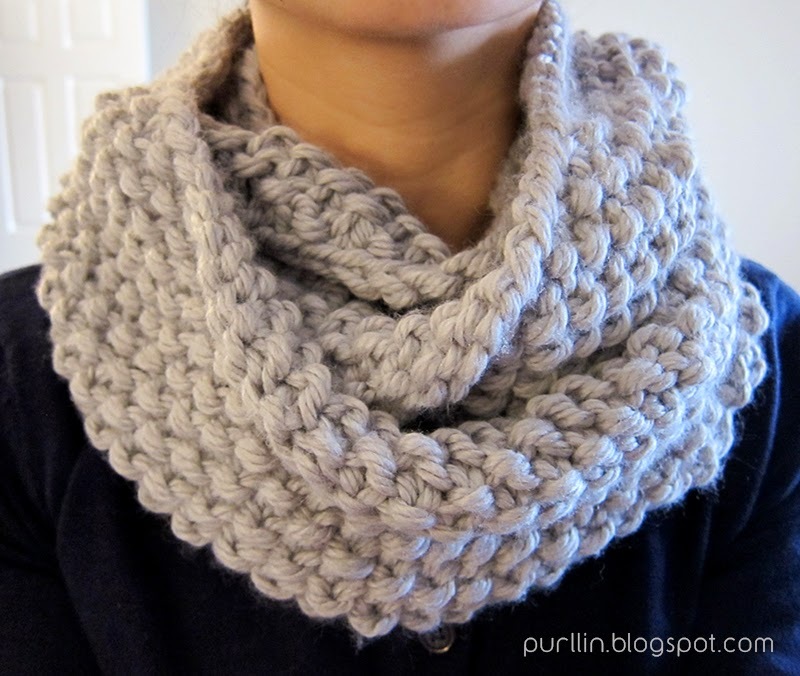 I want to make an even bulkier infinity scarf. Could I just increase the pattern to cast on say 150 stitches so that I could loop it three times around the neck instead of just two times? Thanks! Not a stupid question at all! The stitches casted on the needle will look "shorter" when on the needle -- but once you cast off, you will see that the work will appear a lot longer. How much longer will depend on the size of yarn and needle. As long as you use the same size needle as the pattern calls for, and yarn that is weight category: 6 or calls for needle size US 13 (9mm) -- this pattern should work out for you and fit : ) Hope this helps! I really love this pattern and I would like to try it out, but I was wondering if it is possible to create it with strait size 13 needles? Yes you can use straight needles US size 13 -- however, you will need to join the two ends once you complete the work since it'll look like a straight scarf. You will probably want to cast on 20 stitches on your US size 13 needles. And just continue this pattern until you have your desired length (you can determine this by wrapping around your neck as you knit to see if it's "long" enough for creating an infinity circle scarf). Then join the two ends together. I was just looking to see if someone had asked this! I'm going to try this pattern with size 35 needles and see how it goes. I think you may have dropped (or added) a stitch by accident in one of your rounds. 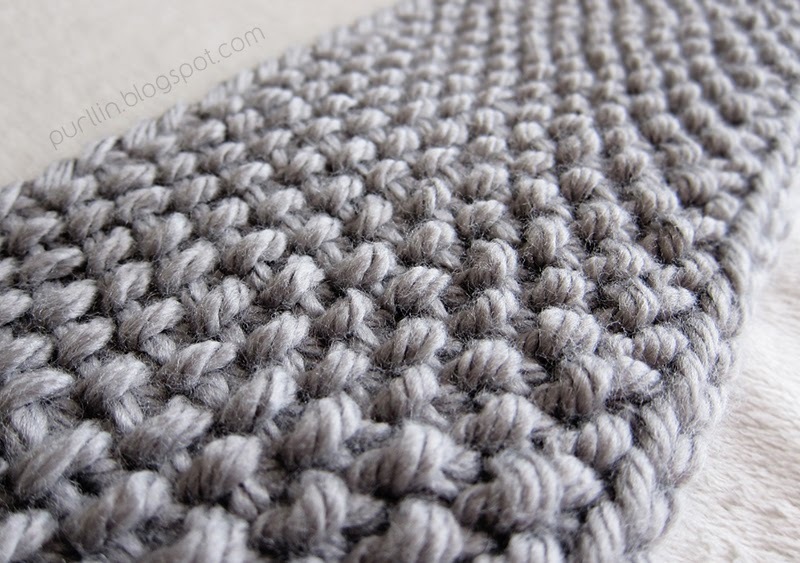 If the pattern is off by one stitch, it will start looking like the rib stitch. 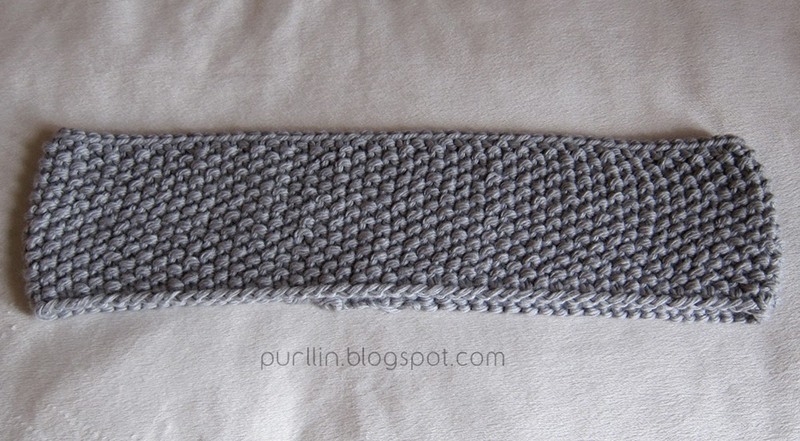 How far have you gone with it looking like a rib stitch? If it's only a few stitches, you may be able to fix it by going back and un-doing the stitches. To keep the seed stitch you want to make sure you purl your knits (from the previous row) and knit the purl stitches (from your previous row). I may have gone 3 to 4 rows with this stitch. I'll try to unravel to save it. I just made this for my friend. This was easy and great, and my first circular knitting project. I used all your tutorials to start it, finish it, and everything. Thanks so much! 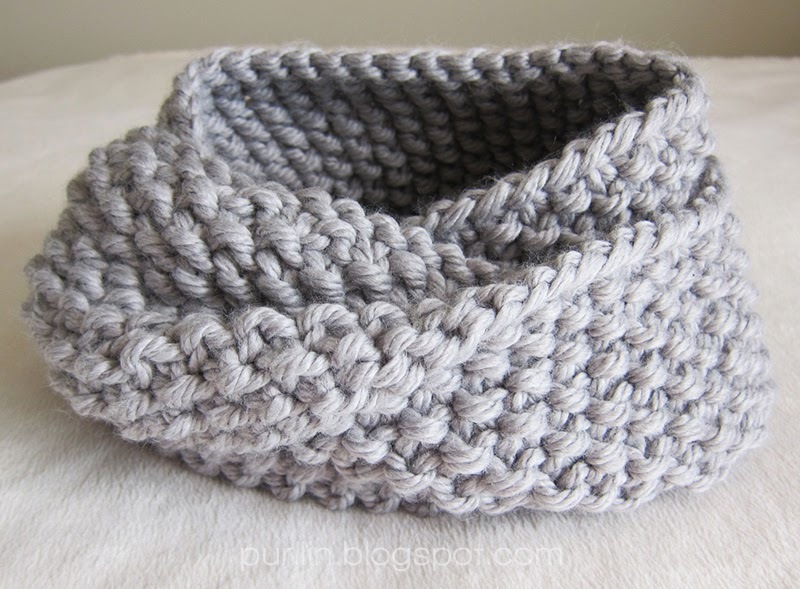 I would love to make this with medium weight yarn instead on chunky. Any suggestions on what I should change other then needle size? Making this today. Tip, a stitch marker helps to differentiate between rows. Lisa, I'm a very, very beginning knitter just finishing up this scarf in Malabrigo Rasta yarn, and it looks amazing, but I'm not on Twitter or Instagram. How can I get you a photo? Lisa- Your pattern calls for #15 circular needles, but in the comments you mention using #13 circular needles. Which would you suggest? Thank you for your time.